We have another awesome transformer model, it is a truck mode or vehicle mode of a Autobot member, Ironhide. This pretty detailed truck is designed by my friend Arif Suseno. 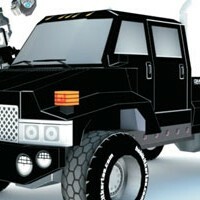 This truck is accompany with robot mode papercraft which can be downloaded at his site, hobikitkertas.com which also hosts the assembly instructions for the truck mode. He said this release also to celebrate 3rd anniversary of his website. The last of its kind, the final part of Devastator paper craft template designed by Arif Suseno. He also include bonus part and addons in this papercraft template, an accurate movie version part, red color for the devastator head. As previous papercraft, this template can be assembly as a vehicle or a robot, you may choose one or make it both. More part for devastator complete papercraft. Arif Suseno (hobikitkertas) designed this mixmaster papercraft and allow his design to be hosted in Paper Replika. You can also visit his site to see the assembly instructions and more of his papercraft designs. This is Arif's (hobikitkertas) 3rd release of the Decepticon series. Hightower combines to Devastator as the left arm. In its vehicle mode, Hightower disguised as a truss crawler crane. This transformers was appear in the ROTF movie only in the shape of Devastator.